I’m staying home today. Sleeping in was nice. Put the grounds in the filter. Add Water. Ok, coffee is brewing. Let’s see. BACON! Oh yea! We have bacon in the fridge. This is the best way to cook bacon. The oven is set at 400°. Melt a couple Tablespoons of Coconut Oil in a large baking sheet. Lay out the bacon side by side and put it in the oven. Set a timer for 8 to 10 minutes. Don’t forget to set the timer! Nobody likes burnt bacon! Ok, its time to make pancakes. I can’t remember how many times one of my children have asked me in the middle of the week, “Are you staying home tomorrow?” My children love Saturday mornings when Daddy stays home and makes pancakes. I have tried several different cook books but eventually settled on this concoction. It works for both pancakes or waffles and feeds our family of 9. Pour the milk in a large mixing bowl and then add 4 tablespoons of apple cider vinegar to it. This makes buttermilk. Set it aside and work on the rest. I am not sure when it started, but many years ago I got up and made pancakes for my children for breakfast. This turned into a tradition that continues to this day. Though, sometimes I make waffles. In another mixing bowl whisk these ingredients together. Children are beginning to arrive in the kitchen. Good morning hugs. I still need to pour a cup of coffee. The BACON! Whew! Timer went off. It is time to flip the bacon over. Once it is flipped, put it back in the oven for 5 more minutes. One thing we have plenty of is eggs. We have at least 10 laying hens. They are a mix of all sorts of breeds. Australop, Americana, Rhode Island Red, New Hampshire Red, Welsummer, Golden Laced Wyandotte, Isa Brown. Plus, we incubated many eggs over the years so there are a lot of cross breeds. We always have more eggs than we need. Great ministry opportunity if someone needs a little help. Separate the egg whites into a small mixing bowl. Add 4 of the egg yolks to the milk. Junebug is our Great Pyrenees dog. She gets a treat this morning. The other 4 egg yolks will go in her dog food. With an electric mixer, mix the egg whites until white and stiff. It takes a minute or two of mixing. This is a great job for our forth daughter to do, but I must keep a close eye on her or egg foam might end up on the ceiling. Vanilla Extract – 1 Tablespoon – Add vanilla to the milk & eggs. Whisk the milk and egg yolks together. BACON! Is it done? You may want to leave it in another minute or two, but set the timer. Nobody likes burnt bacon! Take the bacon out of the oven. Pour the grease into a measuring cup. Put a couple paper towels on a plate and place the bacon on the paper towels. Then cover it with another paper towel so that when the children walk by, they won’t automatically see the bacon and steal it. I still haven’t poured my coffee. Add the flour mixture to the milk and mix it up until you don’t see any dry flour. Now, add some honey. Just squirt some in there from the bottle. Maybe 3 or 4 Tablespoons. It doesn’t matter. Add 8 Tablespoons of bacon grease. Mix up the honey and grease in the batter. Now add the egg whites. Thoroughly mix them in until the batter is nice and fluffy. My beautiful wife, Ruth, has come to the kitchen for a cup of coffee. She looks amazing! I must sneak a kiss and a hug before putting batter on the griddle. She gets the first pancakes. 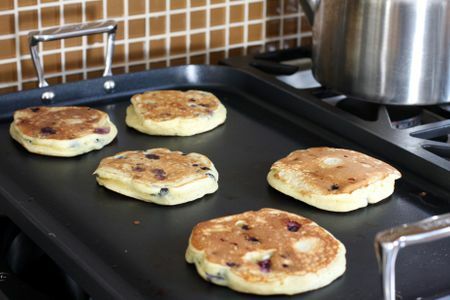 If you are making pancakes add a cup of blueberries. Fresh are great. If you use frozen blueberries add a Tablespoon of flour to them and shake it up to help keep the blueberry juice from turning your batter purple. I don’t put blueberries in waffles, but they will go great on the side. Most the children are up now. Let’s give thanks to God for our breakfast and start serving pancakes as they come off the griddle. I use an electric griddle that can cook about 6 pancakes at a time. That way I can serve 3 pancakes to 2 children each time they are done. I better pour that cup of coffee now. Ahh! Coffee! Breakfast is over. I have a second cup of coffee going and it is time for the greatest blessing we have together. Family Worship. The great preacher Charles Spurgeon and his wife Susie were adamant about family worship. Spurgeon very consistently led his family and any guest they might have every night at 6:00pm. We normally have family worship in the evening, but Saturday mornings are special. No need to rush. Sing an extra song. Everyone to the living room. The guitar is strapped over my should this morning. Using some modern technology we can project the lyrics up on our TV screen and sing together. Let’s pray and ask God to bless our time together. Today we are in Acts chapter 5. We’ve been reading through the New Testament for a several months. We’ve read it through before and we will read it through again. Acts chapter five is great! Wow! Such great faithfulness! Lord help me to be faithful to share the gospel no matter what my circumstances are. We are having a great discussion this morning about God’s faithfulness and our desire to be obedient to Him rather than man. Time to pray again. Do we have any prayer requests? Yes, we will pray for the bunnies and for Mama too. Lots to pray for today. Lots to give thanks for too. … In Jesus Name, Amen. Let’s see what Mr. Wayne has to say this morning. Ok guys, where is Questions God Asks? Here it is on the shelf. We are almost done with this book. Next, we are going to read one of the Building on the Rock Series from Mr. Beeke. 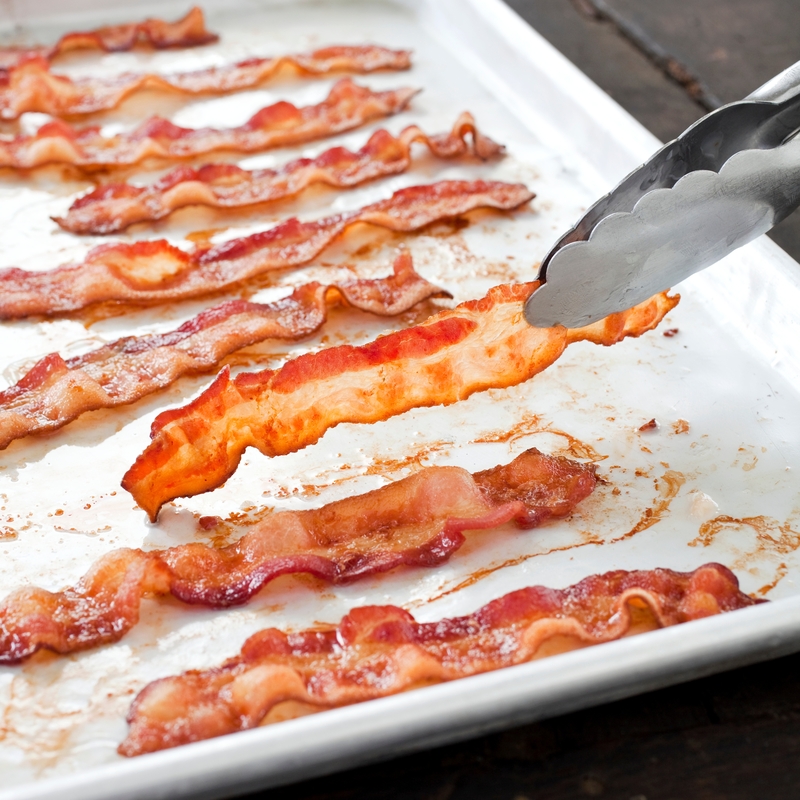 Mmm bacon… can’t wait till the weekend! Thank you for your comment. Bacon is my favorite vegetable.